Antalene Vileta Armstrong, also known as ‘Anta’, aged 73, late of #8 Shepton Lane, Pinelands, St. Michael fell asleep on 13th November 2018. Reputed wife of the late Melville Dawe. Mother of Juliette, Junita and Noel Armstrong. 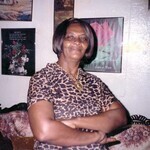 Grandmother of Tina, Alyssa, Ashauna, Mark, Denise and Kirk Armstrong. Relative and friend of many. The funeral of the late Antalene Vileta Armstrong, leaves Tudor’s Funeral Home, The Ivy, St. Michael on Saturday, November 24th, 2018, at 12:15pm for The Church of the Nazarene, Black Rock Main Road, St. Michael, where relatives and friends are asked to meet at 1:30pm for the Service. A private cremation will take place at a later date. The body will repose for viewing in the Chapel of Tudor’s Funeral Home on Friday, November 23rd from 4:00pm until 6:00pm.